Escudero Photography now has a new website feature: Live Video Interviews! For those of you with a hectic schedule, the idea of meeting your wedding photographer may seem overwhelming. 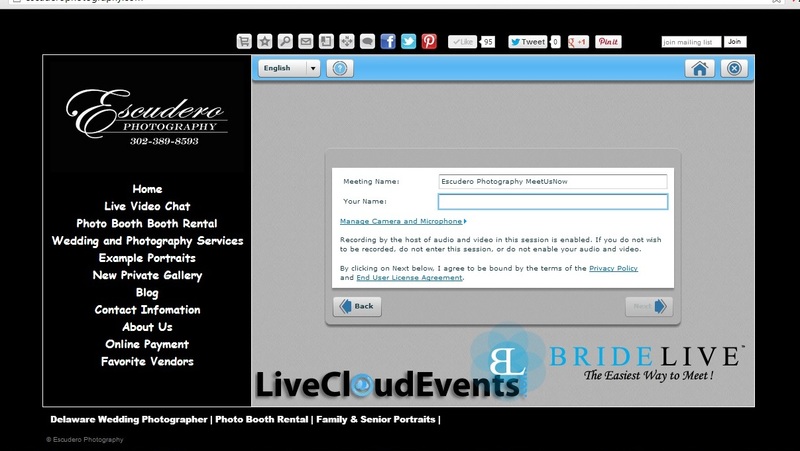 With Bride Live, you can now arrange an appointment easily from the comfort of your own home. All you need is a webcam and a high speed internet connection. You can even use a phone or tablet if it has a front facing camera! Get to know Escudero Photography whenever fits your schedule best. Give us a call or email to set up a time and we will email you a link to chat! This entry was posted in General Notes and tagged Escudero Photography, photographer delaware, photographer maryland, photographer new jersey, photographer pennsylvania. Bookmark the permalink.